QUESTION: “Why does it rain?” Do you know the answer off the top of your head? We COULD search the internet. “Just Google it.” Thousands of people have studied weather and rain for thousands of years, and thousands of articles are on the web. Easy to find the answer. What if a four year old asks the same question? That’s when finding the answer shouldn’t be so easy because finding the answer is the fun part, when the PROCESS of learning is most important. At The Lexington School, finding the answer is how we teach CURIOSITY. It’s a stream of questions, one that leads to the next. PK teachers are ready to float along and facilitate this exciting process of discovery. EXPERT SPEAKER. This time they launched with TLS community connections. The children invited alumnae Emily Deller’s fiancé to help. He is a meteorologist, and he took this PK request very seriously! He sent the class a custom video explaining the mystery of those big, wet drops which they watched in wonder. EXPERIMENTS. His virtual visit gave rise to more wondering, and an experiment with water using shaving cream and food coloring was the next step in their journey to know more about rain and water. I wonder what happens when raindrops collect, when they land in a puddle, when they land on a penny? Enter 4th grade science teacher Leanne Zimmerman to experiment with collecting water droplets on a penny. FIELD WORK. Out goes the class to measure rain drops in a collection cup or to see how far they can blow water through a straw. I wonder how rain changes the water flow in a creek? Put on those walking shoes and grab those clipboards; it’s off they go to Scarlet Gate to collect their own data. DATA COLLECTION. More questions lead to more solutions, and suddenly four year olds are spotted down hallways with clipboards, surveying “exactly how do you like to drink water?” (From a faucet, water bottle, or water fountain). They are all around the school examining, thinking, asking, learning. 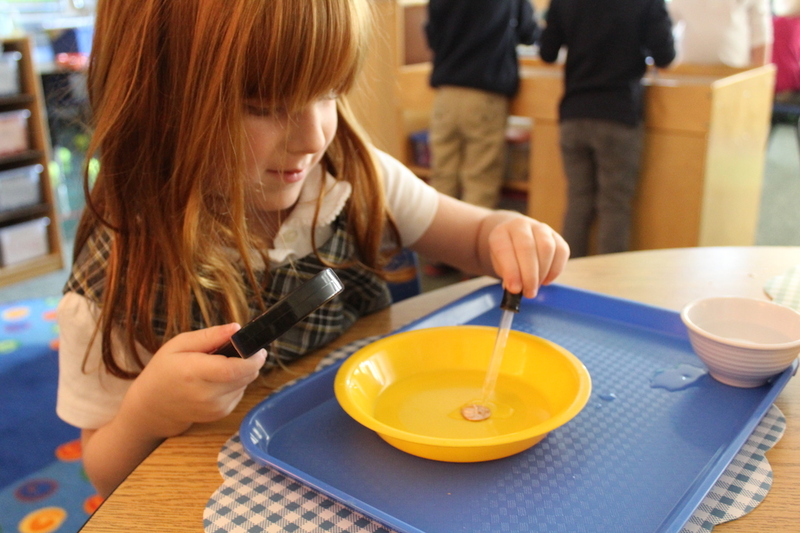 The process of finding the answers is an endless flow in Prekindergarten project work. And it just so happens to work. “I WONDER” is the start to every day at The Lexington School. I wonder what exciting discovery will happen next…stay tuned if you, too, are curious.